In 1 Peter 2:2-3 the addressees are exhorted to "yearn for the unadulterated milk of God's word ... like newborn babies" ( ). This exhortation is motivated by: "since you have tasted that the Lord is good" ( ). This article attempts to establish the referent of . Viewed as part of the "rebegetting" and resultant new birth (cf. in 1 Pet 1:3), 1 Peter 2:3 suggests that God has given the "something" to sustain them in their salvation. The paper concludes that the implicit object of is colostrum. The referent then is that God has given the addressees colostrum as part of the beget/rebirth process, to sustain them in their salvation. Having tasted the colostrum they now know that the Lord is good. This experience of the goodness of the Lord becomes the reason why they (must) yearn for (more) milk, so that they can grow up in their salvation. In 1 Peter 2:2 the addressees are exhorted: . .. ("yearn for the unadulterated milk of God's word ... like newborn babies"). This exhortation is motivated in 1:3: ("since you have tasted that the Lord is good"). 1 Peter 2:3 suggests that God has given the "something" to sustain them in their salvation. This article attempts to establish the implicit object of : what is it - in terms of the beget/birth-imagery - that they had tasted? In this way the referent of is to be established. First the relevant socio-historic context of the addressees of 1 Peter is constructed (2). Then it is explored what the argument of 1 Peter and of the pericope 2:1-3 suggests as the referent of (3). The referents of and in the beget/birth-imagery in 1 Peter is established (4). The author's use of Psalm 34:8 is studied to see what light it sheds on the referent of (5). The implicit object of is established (6). finally the referent of is defined, and it is shown how clarity about the referent of contributes to a more nuanced understanding of the macro argument of 1 Peter (7). 	The self-identification of the author is taken as a matter of fact, as do a number of scholars.3 This viewpoint implies that the letter is to be dated before 70 AD. 	The addressees "represented the broad spectrum of people living in northern Asia Minor" (Achtemeier 1996:57), as indicated in the address of the letter: (1 Pet 1:1). 	The labelling of the addressees4 as (resident foreigners of the Diaspora, 1:1; 2:11) and (visiting foreigners, 2:11) refers to the fact that the addressees were, already before their conversion to the Christian faith, "visiting and resident foreigners" in the literal sociopolitical sense of the words (Elliott 1981:32). Having status in the first century AD already implied hardships (Berger 1953:626). The suffering was not caused by official persecution, but by spontaneous local social ostracism (Elliott 1986:14; Breytenbach 1998:341; Balch 1981:95). 	However, the label does not merely describe their social position; it indicates their previous status as "God-fearers" as well, the and the (Van Unnik 1980:72-74). It is part of the adoption of the honorific titles of the Old Testament people of God, transforming the title into a proud self-identification (cf. feldmeier 1992:104). 	When these foreigners became Christians, it had positive and negative social consequences. On the positive side: they became part of a Christian group and were no longer isolated individuals or small groups. Those who d been God-fearers and could not become full Proselytes, no longer were second class members in the new Christian group. 	The new Christians, however, also had to cope with negative consequences as a result of their new alliance. The unjust suffering which they had to endure as (political) foreigners, became even more severe, since now one more dimension has been added to their "otherness": the fact that they have aligned themselves with an obscure foreign sect. This resulted in further and more intense ostracism and discrimination. These circumstances forced many of them to consider to retaliate the injustices they suffered, or even to forsake their new commitment to the Christian faith. The author uses the letter to persuade the addressees of their status as saved persons before God, of God's loving care for them, and of Christ's vicarious suffering and subsequent glory and supreme power. All of this is, however, not the purpose for writing; it serves as basis for the actual purpose: ethical exhortations to have a good lifestyle ( , 2:12) and to persevere in doing good ( , 4:19), even amidst and in spite of their own suffering. The macro argument of the letter has been argued by Van Rensburg (2006: 481-488). The pericope 1:3-12 is the basis for the rest of the letter, with the key-phrase the reassurance in 1:3 of the fact that God has begotten5 the addressees anew: . .. The body of the letter is largely paraenetic, with the pericope 1:3-12 as motivative basis for four inferential exhortations, viz 1:13-25, 2:1-10, 2:11-4:19, and 5:1-11. The pericope 2:1-10 is introduced by the relation particle , which marks 2:1-10 as "Result".6 Because of its content 2:1-10 is interpreted to be on the same level as 1:13-25, which means that 2:1-10 is a second exhortation that has the fact that God has begotten the addressees anew (1:3) as "Reason". The function of the relation particle is therefore to mark 2:1-10 as "Result" in a "Reason" "Result" relation with 1:3-12. The pericope 2:1-10 can be divided into two sub-pericopes, each with an imperative as main verb, viz (2:2) and (2:5). The asyndeton7 in 2:4ff is interpreted as additive equivalent coordination of 2:4-10 to 2:1-3, implicating the continuance of the of 2:1. The relative pronoun ( ) undergirds the connection. This means that 2:1-3 and 2:4-10 is a double "Result" in a "Reason" "Result relation with 1:3-12. The local argument of 2:1-3 therefore is the following: The basic exhortation is that the addressees should "yearn for the unadulterated milk10 of God's word" ( , 2:2b). The way in which this yearning must take place, is "like newborn babies" ( , 2:2a), who have been (re)born as a result of having been begotten anew by God. This suggests an expansion of the "new begetting"-metaphor introduced in 1:3 ( ).11 The argument is: "God has begotten you anew. This resulted in your new birth, and now you are a baby." The baby will only grow to its full salvific capacity if it gets the right nutrition, and this is the goal with the exhortation to yearn for milk: ("so that by it you may grow up in your salvation," 2:2c). A motivation for this exhortation is given in 2:3: ("since you have tasted that the Lord is good"). This motivation is yet another expansion of the "new begetting" metaphor, utilizing an adaptation from the words of LXX Psalm 34:8. The verb , as will be argued under point 5 and point 6 below, suggests that the newborn suckling baby has tasted "something" that is good, and will therefore want more. The participial phrase in 2:1 signals an activity (the laying aside of the bonds of sin from their past) that must take place simultaneous with the execution of the exhortation to yearn for the milk. The laying aside of the bonds of sin from their past marks their progress in growing up in their salvation, and it demands a lot of effort and energy. They will only have the necessary energy and stamina when they get the right nutrition ( ). The referent (within the beget/birth-imagery) of this "something" that the addressees have tasted, must now be established. It is the "something" that they have tasted, that has persuaded them that God is good and motivates them to yearn for the unadulterated milk of God's word. The nutrition they gain from this will provide the stamina and energy needed to grow up in their salvation and have the capability to lay aside all evil-doings (sampled in 2:1). The intentional function of the exhortation ("yearn for the unadulterated milk of God's word, so that by it you may grow up in your salvation") within the argument of 1 Peter is twofold: (1) to emphasize that their salvation has already been effected, and (2) to persuade them that they have the obligation to grow up in their salvation. If they do not comply, their salvific status is intact, but they will remain babies. The intentional function of the statement . .. ("like newborn babies ... you have tasted that the Lord is good") within the argument of 1 Peter is that it expands the beget-metaphor while reverting back to it. Viewed as part of the "rebegetting" and resultant new birth, God has given them something to sustain them in their salvation. The taste of this goodness of the Lord is the reason why they must yearn for "the unadulterated milk of God's word", which will make them grow up in their salvation. To identify the referent of the "something" they have tasted, the following now needs to be done: first (4) the referents of and in the beget/birth-imagery in 1 Peter is investigated, then (5) the author's use of LXX Psalm 34:8 in his argument, and finally (6) what the grammatical object and (7) the referent of is. The verb is used in the New Testament only in 1 Peter, in 1:3 and 1:23. In the LXX it is not used at all, except for one doubtful variant in Sir Prol. ln. 28 v.l (BAGD ; Michaels 1988:17). To depend on the use of semantic equivalents and etymological derivatives in other books of the New Testament brings with it the danger of illegitimate totality transfer of meaning.12 It is more plausible to establish the referent of by studying its place and function in the rich family imagery in 1 Peter. In 1 Peter 1:3-5 and in 2:1-3 there are no less than five components of the family imagery: (1:3), / (1:3,23), (1:4), (2:2), and (2:3).13 This suggests (but taken on its own it is not conclusive) that refers to God begetting the addressees anew, a rebegetting that resulted in a new birth. The therefore refers to the starting point of a process by which God has caused the addressees to have re-started their life, this time within an intimate and caring relationship with him. Philo uses the noun once (Aet. 8.9), in the sense of regeneration. After having explained the view of the Stoics on the creation and destruction of the world and that fire is the cause of the corruption of the world, he states: ("from it again a regeneration of the world takes place through the providence of the Creator"). Josephus (BJ 4.484) has a very interesting use of a participial form of although in a totally different context. After telling the story of Sodom, he says that there are still the remainders of the fire and traces of the five cities. He then adds: ("as well as the ashes regenerated in their fruits, which fruits have a colour as if they were fit to be eaten, but if you pluck them with your hands, they dissolve into smoke and ashes"). This interpretation is contra that of Louw & Nida (1988). 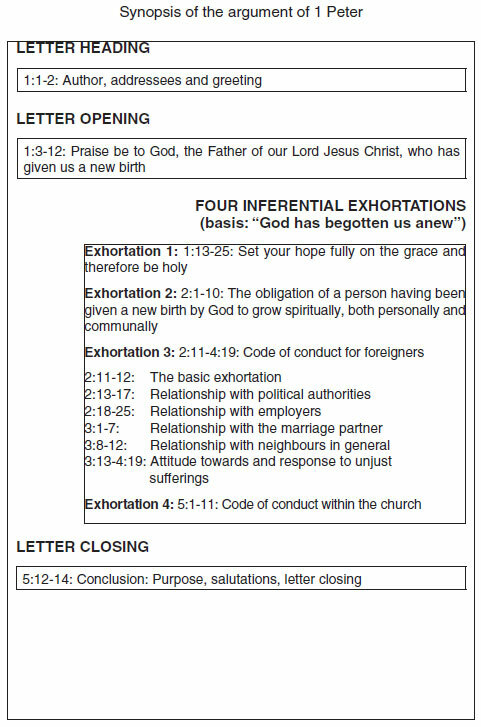 This lexicon lists as Domain 13.55 (Be, Become, Exist, Happen), and defines its meaning as "to cause to be changed as a form of spiritual rebirth", and proposes as English equivalents: "to cause to be born again, to be given new birth". The lexicon (1988, Domain 13.55) adds: "In its NT usage , of course, has nothing to do with birth as such, but refers to a radical change in personality, with the attendant change in state, and it is for that reason that is here classified in Domain 13". The lexicon lists and as Domain 41.53, defining its meaning as: "to experience a complete change in one's way of life to what it should be, with the implication of return to a former state or relation". The lexicon (1988, Domain 41.53) adds: "It is also possible to understand in Jn. 3.3 as meaning 'from above' or 'from God', a literary parallel to the phrase in Jn. 1.13." The first of the Louw & Nida lexicon's proposed English equivalents for ("to cause to be born again") is acceptable, although the focus on the "born again" is already problematic. The second English equivalent ("to be given new birth") is not acceptable, since not the "birth" is the referent of , but the "begetting". It can therefore be concluded that in 1 Peter refers to God begetting the addressees anew. The use of in 1 Peter 2:2 opens a window on the reality of the addressees of 1 Peter.16 Van Unnik (1980:67) was the first to take into account that the Proselytes were regarded as 'newborn babies', as persons who enter a new sphere of life. The rituals through which a person became a Proselyte (circumcision and baptism) signify that all that has gone before, falls away and that former transgressions17 no longer matter (Van Unnik 1980:67).18 All of this confirms that the referent of is the process by which God has caused the addressees to have re-started their life, this time within an intimate and caring relationship with him as the one who has begotten them anew, and this resulted in a new birth; because of this new birth the bonds of sin from the past are now broken. It can therefore be concluded that the referent of as newborn babies, fits the beget/birth imagery very well. The phrase in 2:2 moves the focus away from the initiation of the rebirth-process (the begetting), to the result of the birth: the newborn baby.  The Aorist indicative represents a change by the author from the LXX Aorist imperative . This means that he purposefully signals that the act of tasting had already happened. This leads to the conclusion that the "something" that the "newborn babies" had already tasted, must have been given to them, within the beget/birth imagery, between the present time of their being "newborn babies" and the time of their birth. This suggests that the tasting happened soon after birth. The yearn exhortation ( ) has as object milk ( ), and it is suggested by in 1 Peter 2:3 that the object of the taste-activity is (a form of) milk. Immediately colostrum springs to mind, and the possibility that the implicit object of actually is colostrum, needs to be explored. This means that the referent of is the following: Viewed as part of the "rebegetting" and its resultant new birth, God has given the addressees colostrum, to sustain them in their salvation.24 Having tasted the colostrum they now know that the Lord is good. This experience of the goodness of the Lord becomes the reason why they must yearn for more milk. The milk they are urged to yearn for, is no longer colostrum, which, as part of the birth-process (i.e. as part of the process through which God has saved them), was for their initial sustenance. Rather the milk they should now yearn for is the "unadulterated milk of God's word", which will make them grow up in their salvation. "To grow up in your salvation" ( ) does not mean that through the milk they will grow and as a result receive salvation,25 but that the milk will enable them to live up to their status as children of God. Since their rebegetting and sequential rebirth, they already are saved and are therefore children of God. They now have the obligation to live up to their status as saved persons, as children of God. The more they digest the unadulterated milk of God's word, the more their lifestyle will evidence their status as persons (re)begotten by God, as children of God. Having established the referent of , it is now possible to - by way of conclusion - indicate how clarity about this referent, contributes to a more nuanced understanding of the macro argument of 1 Peter. The author of 1 Peter, right at the outset of his letter (1:3) and two more times (1:23, 2:2-3), uses the beget/birth-imagery to persuade his addressees that they are what they are because of God: God, in his great mercy and because of no other reason than his own will, took the initiative. The author argues this in terms of the beget/rebirth-imagery: God rebegot them, as if in a woman's womb, using the everlasting seed of his word. In this way he effected their (re)birth, and as part of the beget/rebirth process, he provided them, as newborn babies, with colostrum - the immediate sustenance they needed. In all of this God's mercy, his goodness has become evident. This status that they have before God as his children, is therefore in no way at risk of being changed or neutralised by either their trying circumstances or their own weakness. They received from God, as part of their beget/birth-process, colostrum. Having tasted the colostrum, they have been persuaded that the Lord is good. This fact should motivate them to yearn for the unadulterated milk of God's word. The more they feed on and digest this unadulterated milk, the more their lifestyle will evidence their status as persons (re)begotten by God, thus: their status as children of God. In this way the author empowers his addressees to be ready to receive and practice the directives he will be giving in the remainder of his letter for their lifestyle. LA LECHE LEAGUE [s.a.]. Colostrum. [Online.] Retrieved from: http://www.lalecheleague.org/FAQ/colostrum.html [2006, 2 April] [ Links ]. 1 Cf. inter alia Achtemeier (1996:61-62); Aune (1987:159); Goppelt (1978:45); Thurén (1995:93-94); Elliott (1986:11). 2 Cf. Aune (1987:185). The addressees, however, are not just readers in general; they are specific persons in a specific (albeit wide) area (Thurén 1995:95). 3 E.g. Selwyn (1947:27-33); Thurén (1995:25-28); Van Unnik (1980:80). Contra Achtemeier (1996:1-42). 4 Cf. excellent surveys on the scholarship on the identity and circumstances of the addressees of 1 Peter by Goppelt (1978:161-177); Achtemeier (1996:50-58); especially feldmeier (1992). 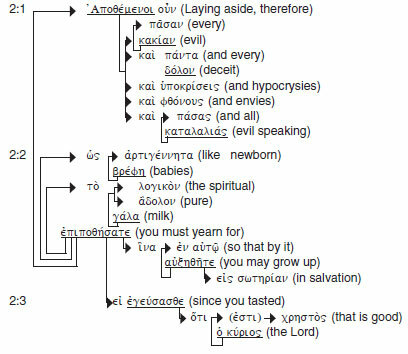 5 The English equivalent "(God) who has begotten us anew" is used for the Greek participle , to stay as close as possible to the referent of the verb . The result of this "rebegetting" is a new birth (2:2) (cf. Achtemeier 1996:91). 6 a marker of result, often implying the conclusion of a process of reasoning (Louw & Nida 1988,I:783). Cf. also Denniston's discussion of . He (1966:xlx) states that has an inferential function. He (1966:l) adds that it sometimes refers back to the general situation, and not to any particular set of words. It could refer back to the motive (not the content) of the preceding words, to a far back remark in a continuous discourse, to an individual word or phrase, or to an idea suggested rather than expressed. 7 Greek can express the interrelation of sentences either explicitly by the use of relation particles, or it can dispense with connection, using asyndeton (Blass, Debrunner & funk 1961:225). Asyndeton refers to the phenomenon that Greek sentences sometimes do not have a relation particle. Asyndeton in itself, like a "zero" morpheme in linguistic theory (Poythress 1984:318), then actually becomes the relation marker. This approximates what Denniston (1966:xliii) calls formal (as distinct from stylistic) asyndeton. 8 Michaels (1988:93) also points to a shift from an individual to a corporate focus: "having spoken of individual spiritual growth in vv 1-3, Peter now turns his attention to the church as a community of believers." 9 In most Bible versions the participle is translated as an imperative, which means that two exhortations are given in 2:1-2: to lay aside the listed wrong-doings ( ), and to yearn for milk ( ) (e.g. Michaels 1988:82-83). Grammatically it is possible, but this interpretation does not make clear what the logical relation is between the imperative and the participle . Achtemeier (1996:143), although translating rather neutral ("after putting off ..."), later (1996:145) says: "because Christians have put away divisive vices (2:1) ..., they must now yearn for God's word." This creates the impression that the author exhorts the addressees to first lay aside the listed wrong-doings, and then yearn for the milk. 10 Cf. Achtemeier (1996:146-147) for a convincing argument for rendering the phrase as: "the unadulterated milk of God's word". In the research tradition both and have been interpreted in different ways, as extensively discussed by Jobes (2002:1-14) in her survey of the research on the milk metaphor in 1 Peter 2:1-3. Different Bible versions evidence the diversity: NRSV/ GNT/NLT: "pure spiritual milk"; ASV: "the spiritual milk which is without guile"; Darby: "the pure mental milk of the word"; 1983/92-Afrikaans: "die suiwer geestelike melk"; 1933/53-Afrikaans: "die onvervalste melk van die woord"; NIV/NASB95/NkJV: "the pure milk of the word"; kJV: "the sincere milk of the word". However, for the purpose of this paper it suffices to translate the phrase as: "the unadulterated milk of God's word". The referent of is thus the "Word of God". 11 Jobes (2002:1) also views 1 Pet. 2:1-3 as a continuation of the "new-birth motif begun in chapter 1". 12 In John 3:3,7 / is used. This could be a Johannine adaptation making possible either the meaning 'born again' or - as the use of in John 3:31 suggests - 'born from above' (cf. Michaels 1988:17). 13 To these five components can of course be added the other facets of the family imagery in 1 Peter, viz. 'redeemed by God into his household' (Van Rensburg 2005: 421-422) and 'having been transformed by God into his nation' (Van Rensburg 2005: 425-426), which makes the present argument about the referent of in 1 Peter even stronger. 14 In the LXX there are references to divine begetting (e.g. Deut. 32:18; Ps. 2:7; Prov. 8:25), but, as Achtemeier (1996:94) observes, they are not of a kind to suggest a source for 1 Peter 1:3. 15 However, the BAGD's different rendering of (1:23) with "born again not of perishable seed", is not substantiated, and - to my mind - not valid. In 1:23 it is yet again the "begetting anew" that is in focus; the "new birth" is the result of the begetting, and can not supplant the begetting. The result of the begetting, the birth, comes into the argument only in 1 Peter 2:2. 16 In using this "window" heed is taken of what Breytenbach (2005:190) has aptly said: "In metaphorical language use, some characteristics of the event(s) and/or entity/ies of a source domain are selected and mapped unto the event(s) and/or entities of a target domain. In terms of the rules and functions of mapping across semantic boundaries, it is inappropriate to demand the target to be described as a replica of the source." 17 Werblowsky (1975:203-204) convincingly argues that the Proselyte baptism had a halakah-function. 18 Van Unnik (1980:67) strengthens his already strong argument by showing how the breaking of the bonds of sin from the past ( , 2:1) is reminiscent of the lists of the virtues of Proselytes given by Philo (De Paenitentia 2). 19 Michaels (1988:90) also gives a "certain literal quality" to , but then, in the further development of his argument, views "Christ the Lord" as its grammatical object. 20 Louw & Nida (1988, ) lists in Domain 24 (Sensory events and states), with only one sub domain: 24.72 (Taste). 21 Achtemeier (1996:148) says about 1 Peter 2:3 that "the citation here functions ... simply to reinforce a point able nonetheless to stand without the scriptural support." He gives no further attention to the possible implicit object of . Michaels (1988:83) views the implicit object of as "the Lord himself, an image capturing the intimacy of the believer's relationship to Christ." 22 The author of 1 Peter and his addressees, although fully aware of the sustaining effect of colostrum, would not have been able to explain this effect. Today, however, the characteristics of colostrum are well described. Colostrum is low in fat, and high in carbohydrates, protein, and antibodies to help keep the baby healthy. It is extremely easy to digest, and is therefore the perfect first food for the baby. It is low in volume but high in concentrated nutrition for the newborn. Colostrum has a laxative effect on the baby, helping him pass his early stools, which helps prevent jaundice. Colostrum also provides large amounts of living cells which defend the baby against many harmful agents. The concentration of immune factors is much higher in colostrum than in mature milk. Colostrum actually works as a natural and 100% safe vaccine. It contains large quantities of an antibody called secretory immunoglobulin A (IgA) which is a new substance to the newborn. Before the baby was born, he received the benefit of another antibody, called IgG, through the placenta. IgG worked through the baby's circulatory system, but IgA protects the baby in the places most likely to come under attack from germs, namely the mucous membranes in the throat, lungs, and intestines. Colostrum has an especially important role to play in the baby's gastrointestinal tract. A newborn's intestines are very permeable. Colostrum seals the holes by "painting" the gastrointestinal tract with a barrier which mostly prevents foreign substances from penetrating. Colostrum also contains high concentrations of leukocytes, protective white cells which can destroy disease-causing bacteria and viruses (La Leche League 2006). 23 The BAGD ( ) suggestion to render (2:3) with "experience the Lord's kindness," and classifying it as a figurative extension of the meaning of , does not allow for this metaphoric understanding of , and is therefore problematic. 24 Clemens Alexandrinus (Paedagogus 1.6.49.3.1), although too late to impact directly on the interpretation of either / in 1 Peter, is evidence of an early linking of the milk and the new birth: ("Wherefore the Holy Spirit in the apostle, using the voice of the Lord, says mystically, 'I have given you milk to drink.' for if we have been begotten anew unto Christ, He who has rebegotten us nourishes us with his own milk, the word; for it is proper that what has rebegotten should forthwith supply nourishment to that which has been rebegotten."). This "immediate nourishment" after the "rebegetting" is pictured by 1 Peter as the colostrum, which - in his beget/birth imagery - his addressees "tasted" as part of their beget/birth-process. 25 Contrary to Achtemeier (1996:147) and Michaels (1988:89). Achtemeier (1996:147) argues that "it is more likely that refers to eschatological deliverance than to Christian maturity." This would make the growth conditional for one's deliverance at the time of the final divine judgment, a motif that does not fit in with the macro argument of the letter. Michaels (1988:89) argues along the same lines as does Achtemeier: " in our passage points to a vindication arising inevitably, almost 'naturally', out of the spiritual growth that results from receiving 'pure spiritual milk'."